With Cool Tabs now nothing can stop you from making big decisions. You can now access all the details about your Social Media campaigns so that you can learn more about the people taking part in your promo, visits to your page, and voter profiles. With our new connections to data and charts, you can find out how participants access your campaign, which sources or channels are best for you to spread the word (Twitter, Facebook, invites sent by participants, etc. ), peak users participation days and times, which participants refer the most users, how many people participate using a mobile device, etc. Our updated version of stats will give you an idea of what works and what doesn’t. It means you can stop investing in things you thought would get you a good return, but haven’t. We will take good care of your ROI. Once you try it, life will never be the same. We have moved forward and we would like to help you make your business more profitable. So, without further ado… Let us introduce you to the updated version of Cool Stats! From now on, when you access the statistics provided by Cool Tabs, a larger number of details and graphs will be available to help you know everything about your campaigns. This is the first graph you will find in the ‘Participation’ section, and it is always the most interesting one. This includes the unique users that have liked your page in order to take part in the promotion or competition. 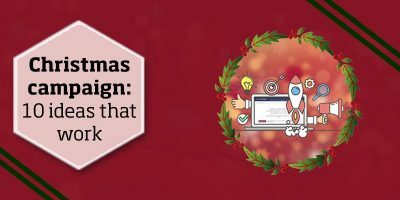 Has your campaign attracted as many fans as you expected? Regardless of whether or not this is the case, remember that they key to success is careful analysis. Also, if your promotion has not finished yet, you still have time to change your strategy. 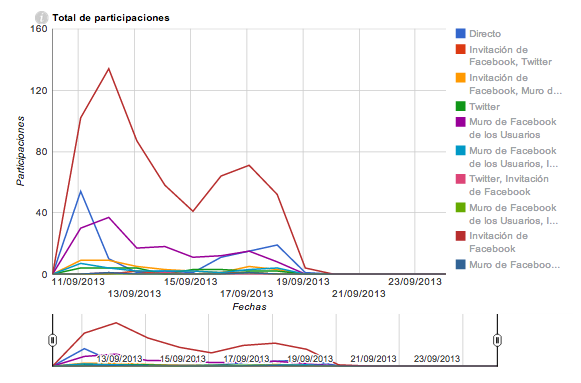 Referred participation: This is the outcome of viral action taken by other users participating in the competition. 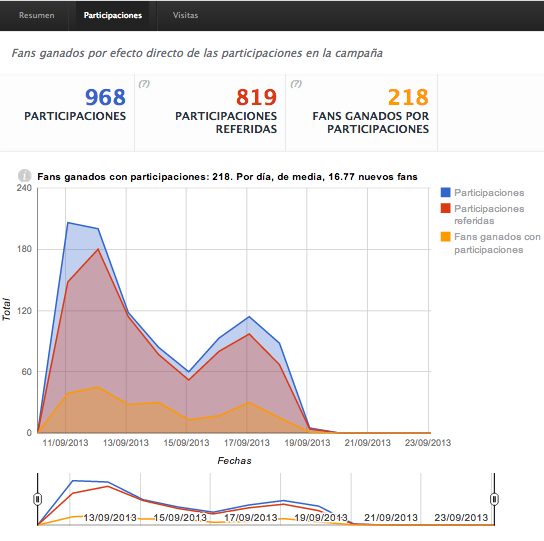 Number of fans obtained through participation: Overall number of users who were not fans before they took part in the promotion. A high level of engagement has been achieved (fans), but not many users have been driven to the promotion. User activity has led to greater participation, but only by users who were already fans of the page. If the objective of this campaign was to attract new fans, and if we’d had the opportunity to analyse this chart before the promotion actually ended, a good move would have been to advertise the campaign in Facebook Ads to reach users who are not fans of this fan page. This shows the number of unique users that become participants each day, as well as the accumulated figure. 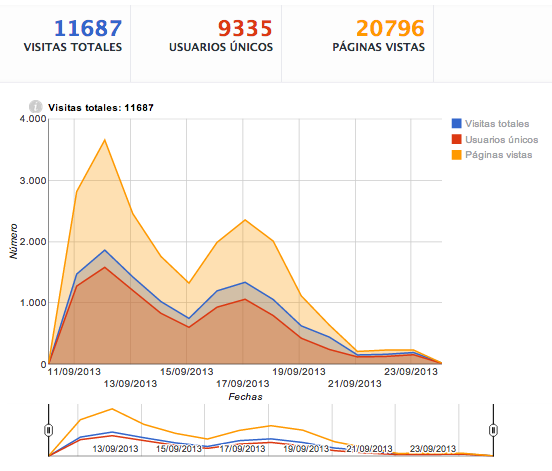 Analysis of sample chart: As we will see below, the overall number of single visitors in this example is 9,266. From this number, the average daily proportion of users turning into participants is calculated at 6.563%. This chart provides information about peak participation hours, letting you to know the best time for you to launch your campaign on your Facebook wall. 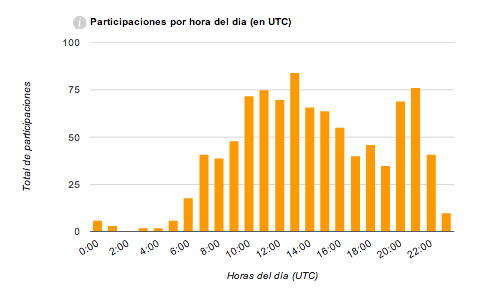 Analysis of sample chart: According to this chart, traffic peaked at 13:00, with 84 participations (information displayed when you hover the mouse over the bar), at 21:00, with 76 participations, and at 11:00 with 75. From this, we can conclude that the vast majority of participations take place between 10 a.m. and 3 p.m., and from 8 till 9 p.m. This is why we should increase our efforts to boost promotion at these peak times. This tells us about the overall number of participations that have been registered on each day of the week. This information is very useful if you want to know which days of the week are best for you to advertise your campaign. Analysis of sample chart: In this example, Wednesday is clearly the best day, with 294 participations (information is displayed when you hover the mouse over the chart bars), whilst Thursday is the second best, with 205. As is the case in most promotions, Sunday seems to be the day bearing the poorest results (60 participations). 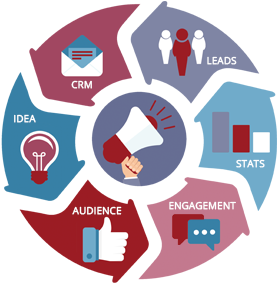 The chart provides the email address, name or ID of users who have attracted the most participants to the promotion. Referred users are those who have taken part in the campaign through a link, a wall post or an invitation from these participants within 48 hours of the link being posted or the invitation sent. Analysis of sample chart: In this campaign, 2 participants have driven 8 new participants each, 8 participants have obtained 6 each, and subsequent participants have attracted 5 or less referred users. This chart shows you the possibilities offered by your own participants, that is, the results you can obtain thanks to them sharing the promotion. Participation from new fans: This shows the proportion of new fan participation, as opposed to previously established fan participation. Participations from mobile devices: This compares the proportion of participation submitted from mobile devices, with those submitted from computers. Participations submitted using other channels: Participations in the campaign submitted through other channels different from the fan page. These channels include your website, blog, and other fan pages. Referred participation: This shows all participation submitted as a result of viral actions taken by other participants, as opposed to overall direct participation. Most participants were already fans of the fan page. 23.5 % of users participated in the promotion through a mobile phone. This is something you need to take into account, and give them access to the promotion through the links we provide, which are compatible with all mobile devices. 84.6% of participants were ‘recruited’ by other participants, and not directly by the campaign. This chart shows the sources from which participation has been received. Sources driving new users to the promotion. 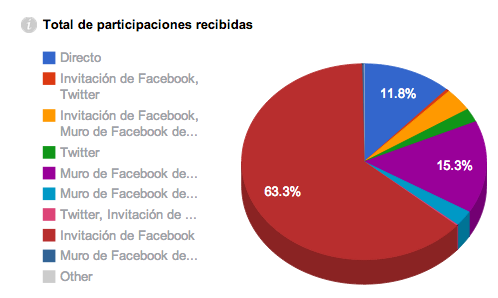 Analysis of sample chart: In this campaign, 63.3% of participations were submitted following an invitation to participate on Facebook, and 15.3% of them resulted from a Facebook wall post. This explains why a large number of participants were referred to the promotion by another user. 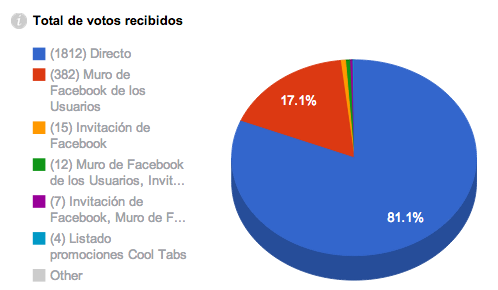 Finally, 11.8% of participations were submitted directly to the promo. This shows the daily progress of the sources from which participation has been received: You can see this progress in more detail throughout the duration of the promo by clicking on each source. Analysis of sample chart: As we learnt in the first chart in this section, there have been two participation peaks. The first was registered at the beginning of the promotion – September 11th and 12th – and the other, slightly lower, on September 17th towards the end of the campaign. 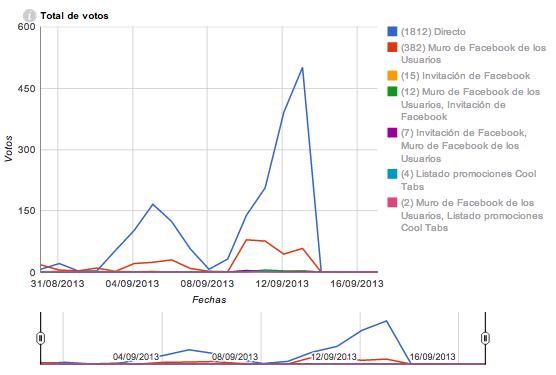 These peaks can easily be recognised in the Facebook invites’ line, as this was the main traffic source of the promo. Moreover, this peak becomes apparent when observing the other lines in detail. These two participation peaks are the same for all sources, which can mean that the campaign has been promoted with the same intensity and on the same days in all social media. This is the first chart you will find in the ‘Visits’ section and it shows the visits, pages browsed, and overall users who have visited the campaign. If you require more detailed information on day-to-day activity, you can edit the date filter found in the chart below. 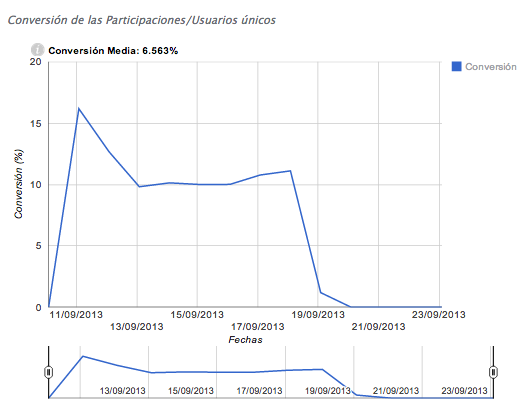 Analysis of sample chart: This campaign has been very visible, and, again we can see that the two peaks for visits, users and pages visited coincide with the peaks in participation. Earlier on, we analysed the peak hours for participation. We will now look at the peak hours for visits. Both charts may well reflect the same peaks. 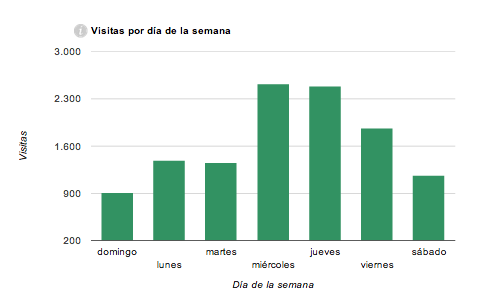 Analysis of sample chart: 1 p.m. is peak for visits. If we hover the mouse over the relevant bar, we can see that there were 975 visits. A participation peak can be observed at exactly the same time. 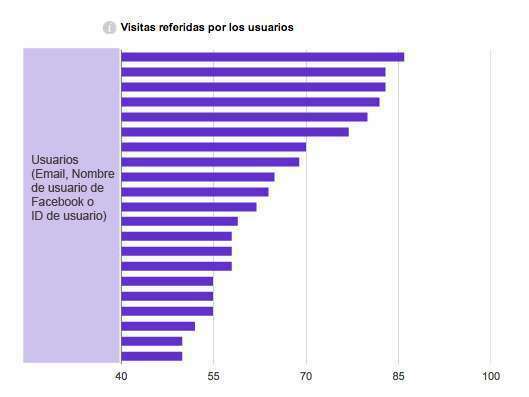 However, even though both the participation and the visit peaks were registered at the same time, the second busiest times were 2 p.m. and 12 p.m., whereas the times with the highest number of participations were 9 p.m. and 11 a.m. This information needs to be taken into account in order to encourage participation at the times where you receive the most visits. 3. 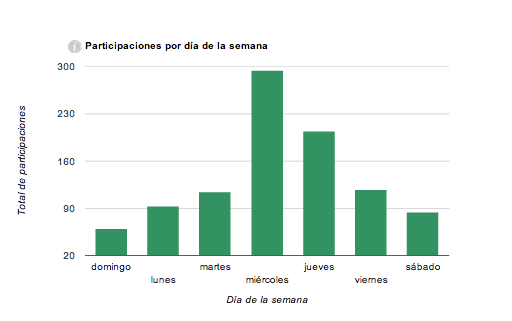 Participation per day of the week. 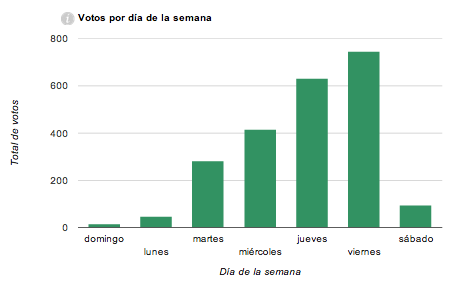 Number of visits per day of the week. Analysis of sample chart: As seen earlier on, a participation peak was registered on Wednesday, on the same day as the visit peak, as described in the chart below. This is closely followed by Thursday, despite participation numbers being lower. This shows the participants who attracted the highest number of visits to the campaign thanks to their viral activities. Analysis of sample chart: Earlier on, we looked at the number of referred participations per unique participant, and now we will analyse the highest number of visits referred from a unique user – 86. Only 5 users managed to obtain over 80 referred visits. 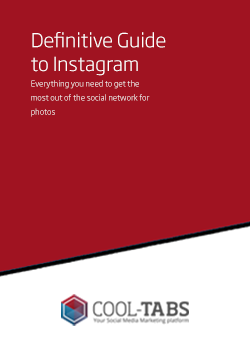 This is yet another piece of useful information, as it reveals the scope of viral action taken by users. 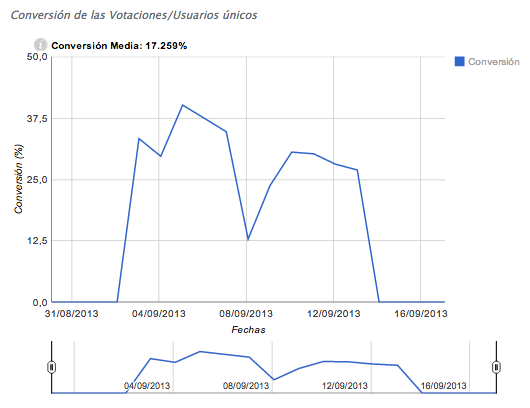 Visits received from mobile devices: This shows the percentage of visits that have been received from mobile devices. 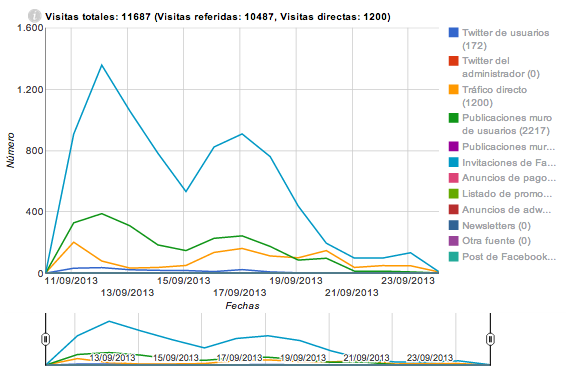 Analysis of sample chart: There are considerably more referred visits than direct visits. As for visits from mobile phones, this figure represents 29.2%. As we said earlier, this number shouldn’t be underestimated, and therefore access from these devices should always be guaranteed. This shows the campaign’s main sources of traffic. Analysis of sample chart: Facebook invites constituted the main source of participants, and, as we would expect, for visits too. This was followed by posts on user walls and direct visits, revealing similar numbers to those produced by the participation sources chart. This shows the number of visits per day for every given source. Analysis of sample chart: Once again, we can see two peaks in traffic which coincide with the peaks in participation on the two first days of the campaign, as well as on September 17th. All sources register these two visit peaks to a greater or lesser extent and the main traffic are the invites sent through Facebook. Referred votes: These are votes received in the campaign as a result of the viral activities carried by participants. Number of fans obtained through voting: Overall users who were not fans of the page before voting, and who have become fans (either because this was necessary in order to vote, or simply because they were driven to the promotion through the campaign). Analysis of sample chart: This example, which is different from the previous ones, shows that many votes were registered in the promotion. Not many of these were referred votes, and a significant number of them came from new fans of the fan page, which means that more fans have been attracted as a result of voting. Don’t forget that voting is a good means of drawing new fans to your promotion, which is why we recommend you to set up your promotion so that users need to click on ‘Like’ to be able to vote. 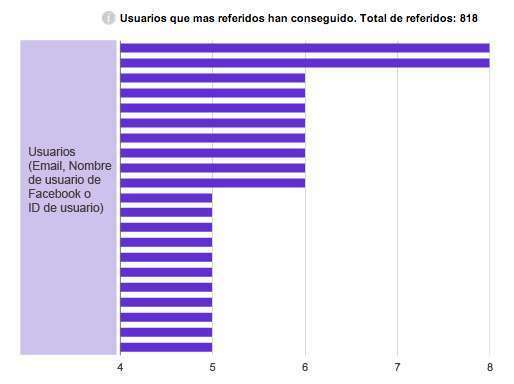 This shows the number of visitors who become voters per day, as well as the accumulated figure. Analysis of sample chart: Users started becoming voters on September 2nd, even though voting was open to users on August 28th. The number of votes cast remained relatively constant up until the end of the promo, on September 13th, excluding weekends, as we can conclude from the significant drop registered on September 8th (Sunday). This shows that users start to vote as other user participations in the promotion spread, and that the campaign is promoted to gain votes. 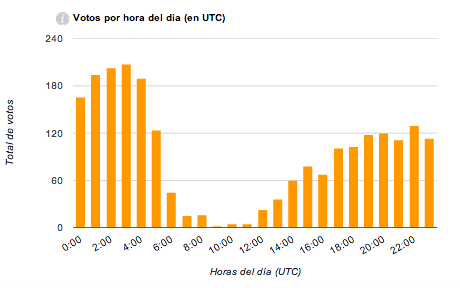 This shows the overall number of votes per hour during a day. Analysis of sample chart: The hours of the day are showed in UTC but this a Mexican promotion, so we need to go back 5 hours. 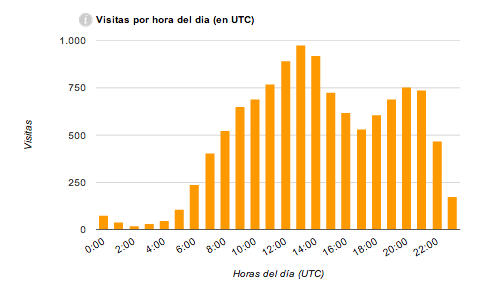 This is why the most activity is registered until 04:00, that is, until 23:00 p.m. local time, and from 14:00, 09:00 in Mexico. This tells us the overall number of votes cast each day of the week for the duration of the promotion. Analysis of sample chart: Unlike many campaigns, a peak was registered in the number of votes on the Friday. This may be due to the fact that the campaign started on a Wednesday and finished on a Friday, and so, the first week could not register any activity on the usually busy Monday and Tuesday. This includes the participants who have gained the most votes from other users through their viral activities. Viral activities can include posting their participation on their walls or on other platforms / social networks, or sending out invites. 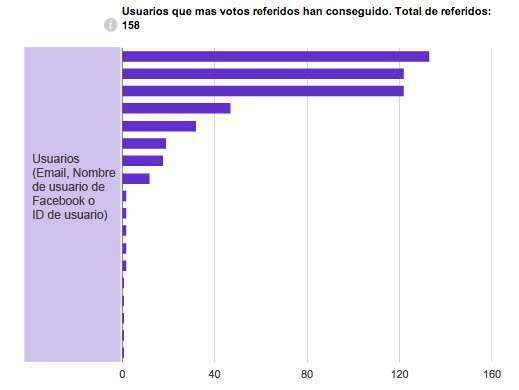 This chart shows the overall number of votes obtained by the most successful users, which were registered within 48 hours of the participant posting the link on his/her wall or sending out the invite. Analysis of sample chart: Only three participants managed to drive 100 votes to the campaign. The forth participant with the highest number of referred votes obtained 47. From the ninth most successful participant on, the number of referred votes drops to 2. 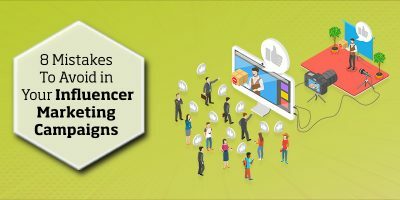 This may be due to the three most successful participants having taken more viral action, being more popular or having more social media friends. 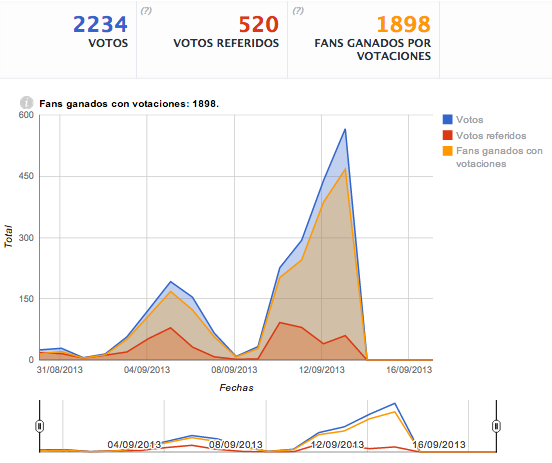 Votes from new fans: This shows the proportion of new fan votes, as opposed to votes from previously established fans. Votes cast from mobile devices: This shows the proportion of votes submitted from mobile phones or tablets, as opposed to the proportion of votes cast from a computer. Votes cast using other channels: Votes received from a channel different from the fan page where the campaign is posted, such as your website, blog, or other fan pages. Referred votes: Votes received in the campaign as a result of viral activities carried out by participants. Analysis of sample chart: These charts reveal that the most votes were received from new fans of the page.Moreover, voting from mobile devices increased to 40%. Votes were only registered on the fan page (the campaign was only published on a Facebook tab).The charts also tell us that the most votes – 80% – were gained directly from the campaign, and are not referred votes. This could be due to the fact that a prize is offered to participants for voting. This shows the sources from which votes have been received. 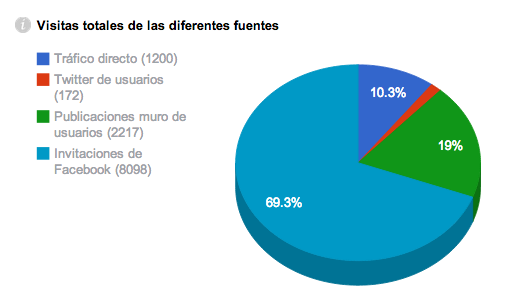 Analysis of sample chart: In this campaign, only 17.1% of votes are the result of posts on user walls, direct traffic being the most significant source of votes. This shows the daily progress of votes per source. You can see the progress in detail throughout the duration of the promo by clicking on each source. Analysis of sample chart: Two traffic peaks were registered in the campaign as a whole and in the votes too, on the 5th and 13th September. Even though some votes received on those days came from other sources, the votes submitted are mainly direct votes. 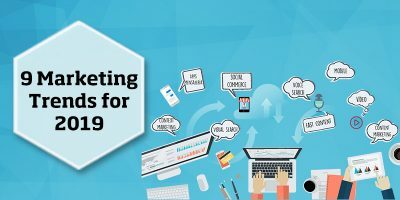 It is always important to find the reason behind the success of direct traffic as opposed to referred traffic. In this case, it may be due to specific campaign activities. Cool Stats 3.0 Essentials can give you all these details From now on, your ROI depends on whether or not you look into all the detailed information we provide for you to analyse what works and what doesn’t. Make the most of the updated version of the stats! *Cool Stats 3.0 Essentials is not available for campaigns created with the Cool Promo Lite application.